*You can make purchases through our website in the parts section. You can explore what we have to offer and make a purchase. We are trying to get everything added as quickly as possible, but please bear with us. If you cannot find a product please give us a call or go to our Request for Parts page and fill out the form. Thank you for your understanding. *Estore costs are at retail price. Tax will be added if you are located in CA. Shipping will be charged after we know the shipping charges. We would like to get you the most accurate statement. All packaged items will come with a receipt on it detailing the items purchased, price, shipping, and tax if applicable. 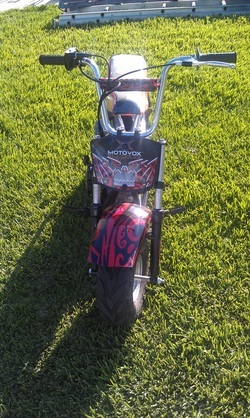 We are looking at starting a gallery of minibikes and go karts that you, our customers, have purchased from us. If you have an old photo or vintage minibike that you would like to see posted you are more than welcome to take part in this as well. If you would like to participate please email us. We will need your name, location, model, and what you use it for. We will send out a form for consent so we can put the picture up. Thank you for everyone who wants to help out. We are looking for pictures from our customers that have bought minibikes and gokarts from us. Also any old vintage minibikes you would like to see up on here as well.